For all petcocks to be used with side float early Bings a 3/16"outlet is avail for +$5. The large tank nut on this type petcock is a combination lefthand/righthand thread style. So understanding how it is intended to function can keep you from ruining it. 1) The petcock nut is taken off, everything carefully cleaned with a toothbrush and solvent, lefthand nut threads are trialed on top of petcock, then taken off. 2) Fit a new red fiber gasket to top of petcock (it just drops right on), thread petcock nut (lefthand) on the petcock about 2 threads. 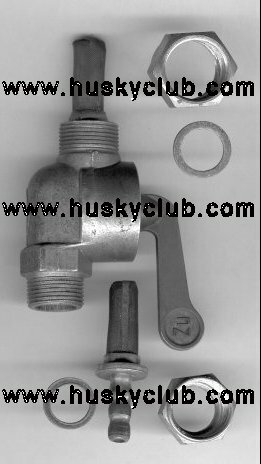 3) Hold nut up to tank connection (righthand) and thread nut onto tank while holding petcock from rotating. As you tighten up the thread at the tank connection, the lefthand will draw up the petcock. After just a fews turns the red gasket will be nicely seating and you should tighten this finally to a moderate torque. Do not overtighten this connection. Do not use any sealants or locktite. 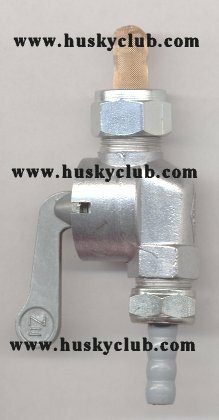 Outlet spigot was increased in size for later model Huskys, this is a direct replacement. You only need the one piece, the new plastic larger outlet spigot. recommended for all race bikes , especially 36mm model 54. Leaving off the screen will improve flow as well. The reserve style petcock (PC2) was fitted to 68-70 motocross Huskys, 68-74 Sportsman or Enduro or WR or RT series bikes. It is recommended for trail riding. Did you know if you that if a piece of debris gets caught in your main jet and you are running hard, that lean mixture and piston seizure can occur. Then you hastily disassemble the carb and never find a cause. A trail bike can benefit from multiple filters in the fuel path. A race bike can benefit from one, large, hiflow gas line filter, and the petcock outlet screen removed. If you remove the inlet filter screen from the petcock, and your tank has rust bits in it, and you swip the petcock on and off after the rust gets in it, it ruins the petcock sealing. PC2 has a removable inlet, tall screen sock. This allows trimming of the reserve and standard standpipe tubes. They are a polymer and are easliy snipped with side cutters. This allows you to fine tune how the reserve setting will work for you. The screen sock easliy slips in and out of its location to allow for trimming or cleaning of the screen. PC2 can be ordered with 3/16" metal outlet (PC-VS)for $5 extra with petcock purchase. You must take your petcock off and clean the screens and inlet area on a regular basis. Don't be an idiot, keep some spare gaskets and grey outlets in your tool box. Maybe even a spare petcock! The early style, 3/16" outlet is cast aluminum with built in screen (as shown as the lower item in the parts picture) and uses a slightly smaller red gasket (PC-VSG)as its seal. Do not run hardware store vinyl tubing for your fuel line. Gasoline will leach out polymer products in this inexpensive style clear tubing and possibly cause jetting and engine problems. I know that the gasoline compatible clear tubing cost more money, but you will actually like the real stuff much better and how much of this are you consuming a year? 10 feet? I don't think so, maybe 3 feet. The cheap clear vinyl can be used for vent lines, no problem. Note: January 03, 2003 - The new PC-4 and PC-2 petcocks incorporate a "revised , improved filter design"! Externally the PC-4 and PC-2 look exactly stock and OEM, but the new filters (one at the tank, one at the outlet) are sturdy, polymer and will eliminate the need for an inline additional filter. These new filters will stand up to many cleanings. i don't have them pictured yet ,sorry.